In the famous old cartoon, an incompetent and startlingly emaciated Wile E. Coyote tests his destructibility while in pursuit of the quick and clever Roadrunner. While the Coyote casts a menacing, if ultimately harmless figure, the Roadrunner is a gentle, aloof creature who wants nothing more than to run fast and eat seeds along a saguaro-speckled highway. Those cartoons were silly fun. Like many people, I even felt that after a while the Coyote really deserved to catch the Roadrunner. But thinkin on it now, it seems like in all the craziness of that show, the Roadrunner's characterization as a gentle is perhaps the most unbelievable aspect. I love Roadrunners. They're big, beautiful, iconic desert birds, and it's truly jaw-dropping every time I see them out and about, even though they're fairly common. They've got cool looking feet and are perhaps the only birds that come with built-in racing stripes! That being said, the Roadrunners I've observed around Arizona are themselves much more ruthless and determined predators than our scraggly coyotes. 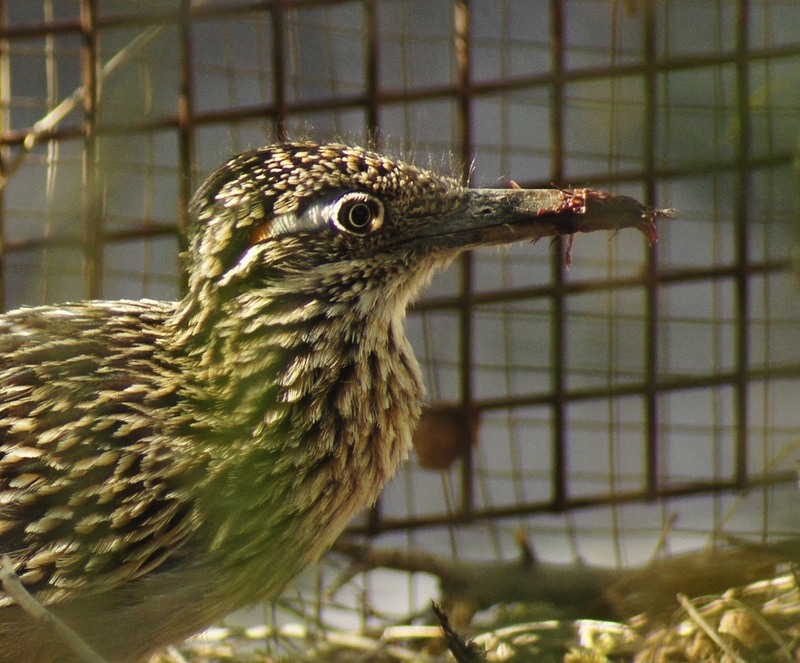 Roadrunners are successful predators because they're not too picky. As any bird book will mention, they eat bugs, small reptiles, rodents, birds, and even fruit if they must. Normally I wouldn't think of a bird from the cuckoo family as a vicious killer, nor even a meat-eater for that matter. 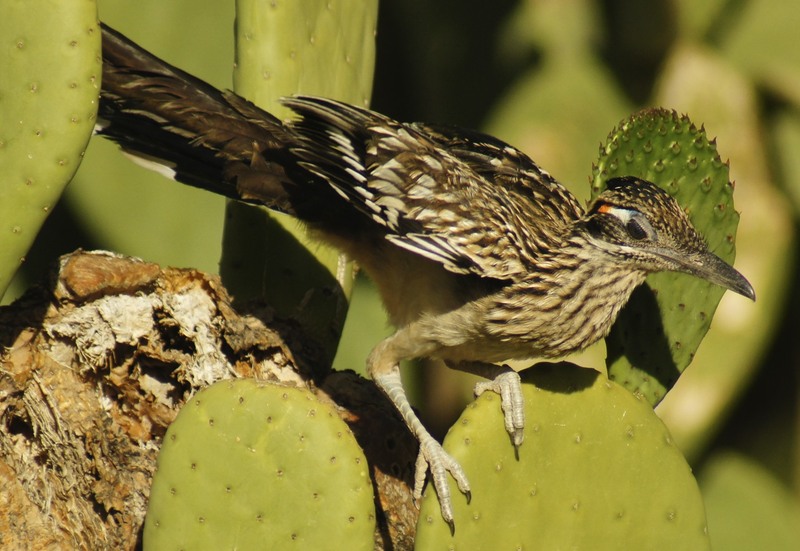 Now, imagining a Roadrunner eating bugs of lizards seems appropriate, even familiar. I've had the pleasure of observing exactly this sort of feeding behavior from time to time. Here a male Roadrunner--identified as a male by the blue and orange in his eyestripe--proudly poses with his cold-blooded kill. I associate certain bird groups as eating certain things. I read that familiar caption, "eats small rodents, birds..." and usually don't think much of it. For the longest time, it almost struck me as a sort of disclaimer, just in case one crazy Roadrunner breaks free from the bug & lizard racket to go after a mouse. I guess I never really believed it because I had never seen it. Hawks, Falcons, Owls...those are the birds that eat other birds, that eat mammals. They've got talons and hooked beaks; they're built for it. Lots of birds eat bugs, and plenty will go for reptiles if given the chance. Without any experience to the contrary, I had just lumped Roadrunners in that group as well. 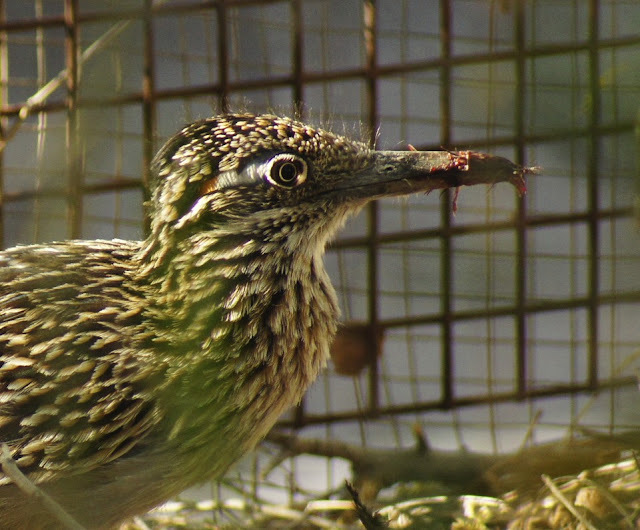 Recently I was confronted with the blunt, graphic reality that Roadrunners really are thoroughly predacious birds, that they do catch warm blooded creatures, and that they'll tear them apart. This Roadrunner, a stout beast-of-a-bird pushing twenty-four inches in length, caught what I believe to be a young House Finch along a perimeter fence at the Desert Botanical Gardens. 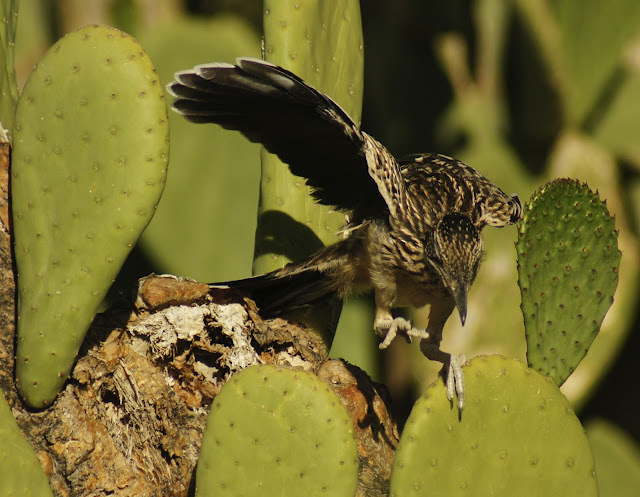 It carried its quarry to a little sunny patch of dried palo verde needles, and then began to disassemble its meal. 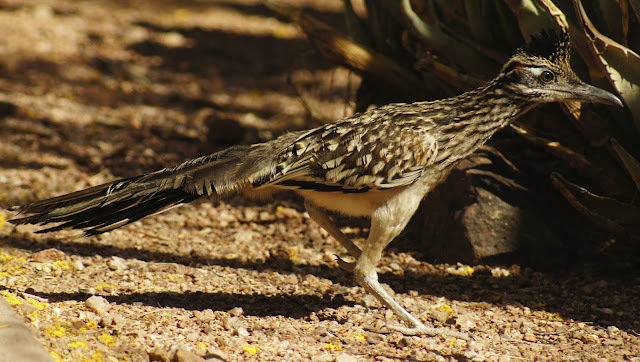 The Roadrunner has neither gripping talons nor an exceptionally strong sharp beak. While pressing his long tail against the fence to sturdy himself, he thrashed his prey back and forth, back and forth, working the edibles loose until he could swallow them in manageable chunks. Raptors can catch, kill, and eat their warm-blooded prey with efficiency and precision. Raptors are really good at what they do. While the Roadrunner is usually a graceful, dexterous creature, here it resorted to blunt force, to wild motion, as it tasted blood. He was determined, but unlike the raptors, seemed out of his element. I don't really know how to explain it. There was just something so disordered about this scene, and not just because of the guts and gore. Looking at a Roadrunner's cool and unique anatomy, even knowing the expert analysis, it just doesn't seem like this kind of graduated predator...and yet here was the proof, staring me red in the face. This is more the image I'm used to seeing: a composed, colorful bird with a keen eye for the next little meal that might scuttle across its path. But there is another side to the Greater Roadrunner. This side is seldom seen, though not because of shyness. It's not the side of the Roadrunner that we see in Saturday morning cartoons or even in many quintessential Roadrunner photos. I guess it's the same harsh realization we come to with many other wild animals. Just when we think they're tame, they rebel. 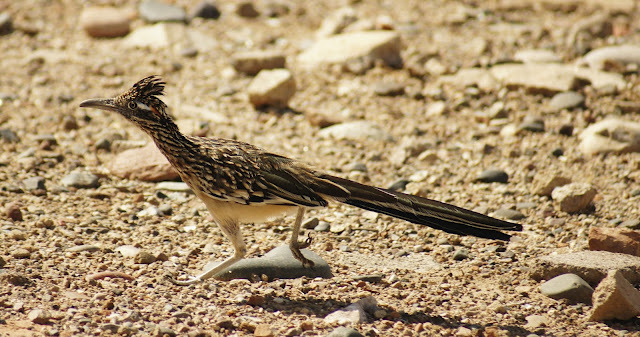 Just when we think the Roadrunner will zig, it zags. In the end, I know no more about this intriguing bird or how to predict its behavior than Wile E. Coyote. A incredible looking thing, I agree! Deer old coyote will have to starve or choose another prey! LOL! Thanks Noushka. That Coyote was always pretty indestructible, but maybe he's still lucky to be alive after so many run-ins with this predacious birds. They do stand apart as an animal. Clearly a bird and clearly predator of some sort...but it's like a miniature velociraptor. Great post, Laurence! Fantastic shots of the roadrunner. We've never seen a wild one. We actually just saw a couple of them at the Atlanta zoo a few weeks ago, and they were much larger than I had imagined. And the warm-blooded meat-eating is news to me! Very cool and gruesome scene you witnessed! It was a cold-blooded kill of a warm blooded critter. Slightly shocking, totally neat...it was one of my favorite Roadrunner run-ins to date. They do get surprisingly big...I'm glad they don't get much larger, that'd scare me. Having read your blog post on the Atlanta zoo too, it sounds like that's a great place. Even so, there' no substitute for the in-the-wild thing. You and Nicholas will have to come and bring your hipness to Arizona some time, benefit us desert dwellers with your residual coolness. @ Glenn, thanks for stopping by and commenting; it's a pleasure to share. A terrific post with images that show great action & behavior Laurence! Thanks Mia. It's definitely been a spring of Roadrunners. I've gotten more and better looks than ever before, and it's wonderful to be able to share. Quite the fascinating and informative post, Laurence! I learned something new today. 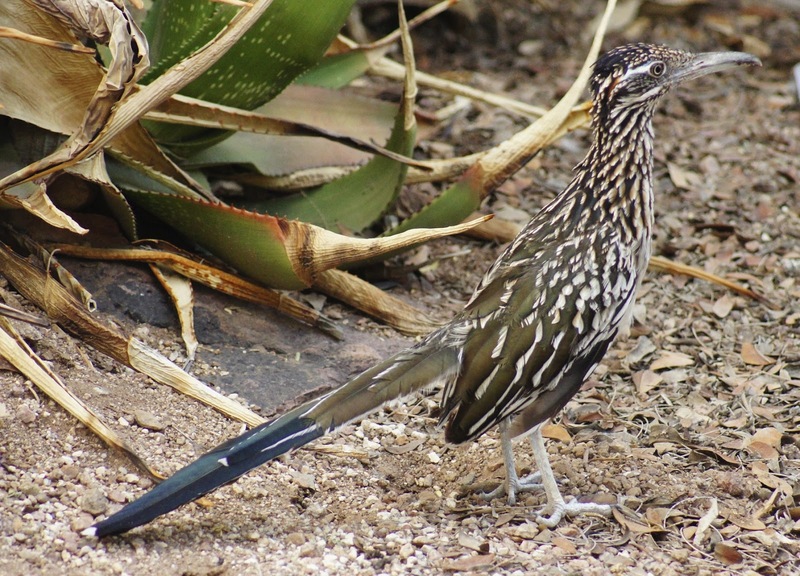 I have never seen Roadrunners in person, so it's nice to view your spectacular photographs here. A very interesting bird, indeed! Thanks Julie! We people can get along with them pretty well...but I daresay that's only because they can't swallow us whole. Hopefully you'll get a chance to see these dinosauric birds soon. Thanks for your kind comment. 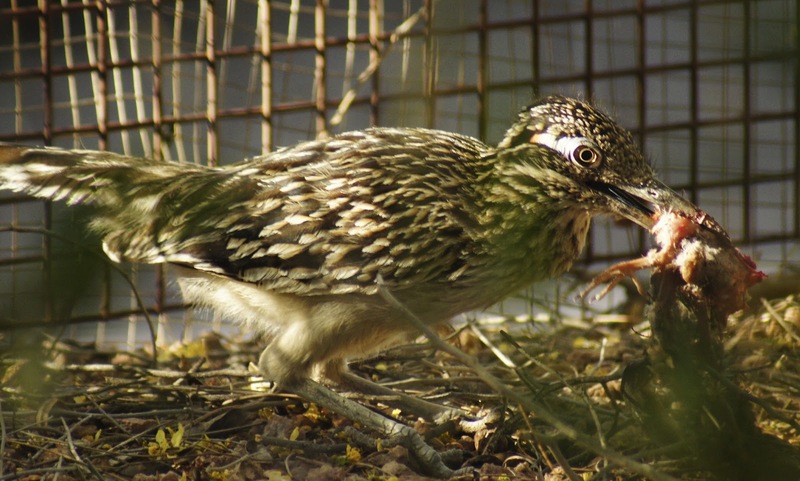 Just this spring I witnessed my local roadrunner catch a baby rabbit, and I have seen one catch a house finch as well. Wonderful birds but formidable predators. I enjoyed your post and the roadrunner photos. It is a cool bird, one I hope to see someday myself. Great post & incredible photos Laurence! That sounds like quite an experience to witness! 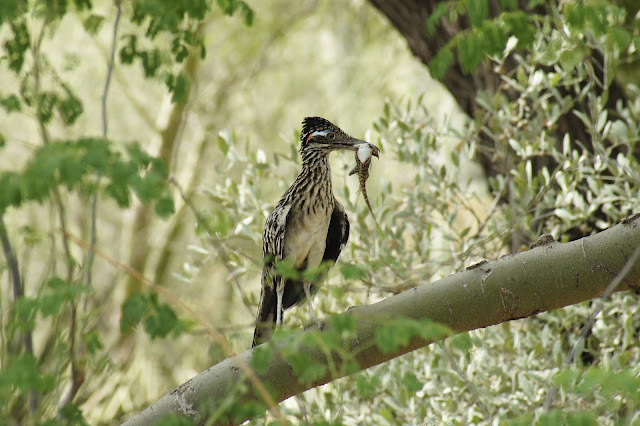 I would have never imagined a Roadrunner eating another bird! Thank you Tammy. It did feel like a weird betrayal or something. 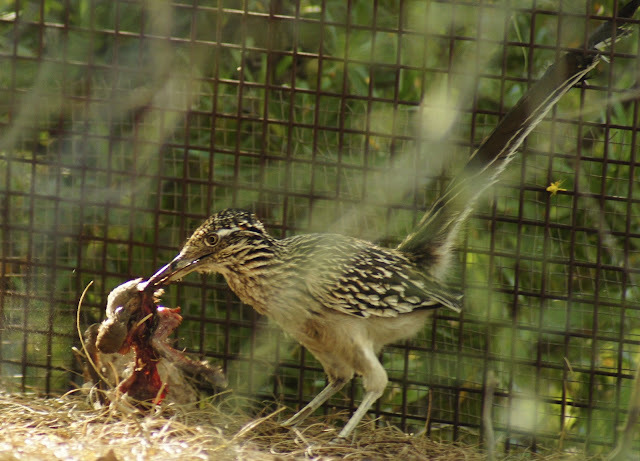 Not just so see a bird eating another bird (hello raptors), but it seemed so inappropriate for a Roadrunner. Clearly, my sensibilities about such things are woefully reserved. Great post and some great photos to go along with all the details. thanks for sharing! Thanks for stopping by Gordon, tis' always a pleasure to share with birders. We flock together after all. Laurence, those are some gruesome photos but they do portray the reality of the hunt and a roadrunner has to eat as well. I have seen them eat lizards and snakes but never witnessed them consuming a bird though I use to fear for my hummingbirds when I lived in AZ! To me, they always looked like dinosaurs when they ran and hunted so it is not too hard to believe what I am seeing here. Great shots. Now, I hope you didn't give any little kids nightmares! Thank you Kathie. I know what you mean about their dinosauric appearance. They really remind me of the velociraptors depicted in movies. I'm glad they're not ostrich-sized! Great pics! I never seen this bird before great to know about it,thanks for sharing about it.